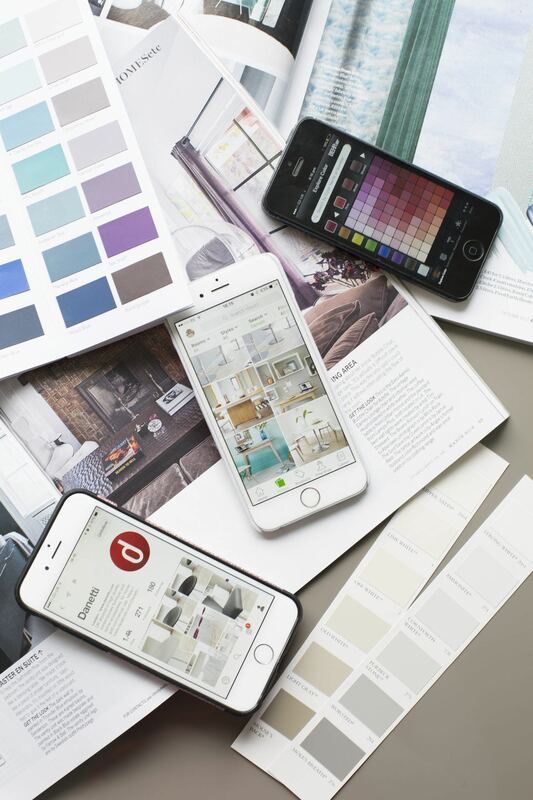 Interior design apps are fast becoming the go-to gadget when it comes to home renovations. 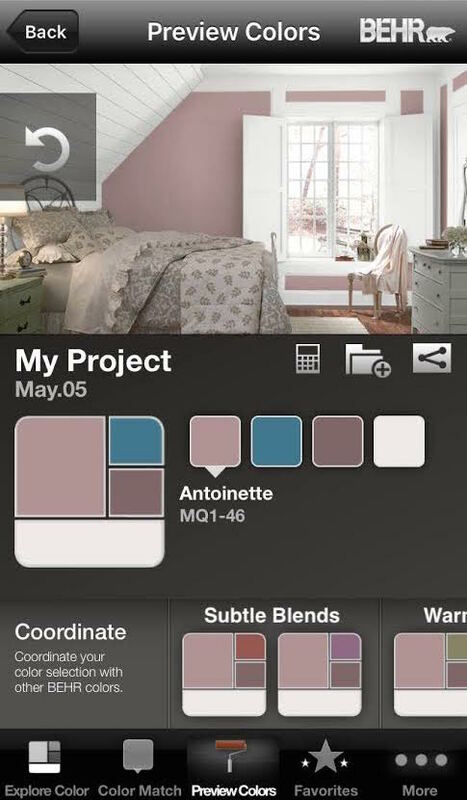 Searching through the various app stores, there’s a decorating app for almost anything; from selecting which furniture pieces you want in your kitchen to what colours would look best on your bedroom walls. We’re not exaggerating when we say there’s a lot out there, that’s why we’ve edited down the top picks to provide you with a manageable and little less scary list. 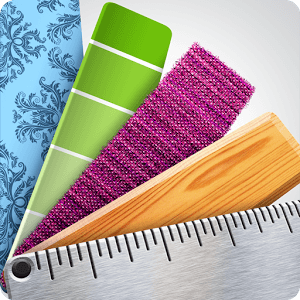 Ideal for amateur interior designers and proud homeowners, this selection of decorating apps for android and IOS will make it easier than ever for you to gather interior design inspiration, learn loads of interior design tips and gain plenty of modern interior design ideas. If you are looking to renovate or redesign any aspect of your home, the Houzz app is a great place to start. 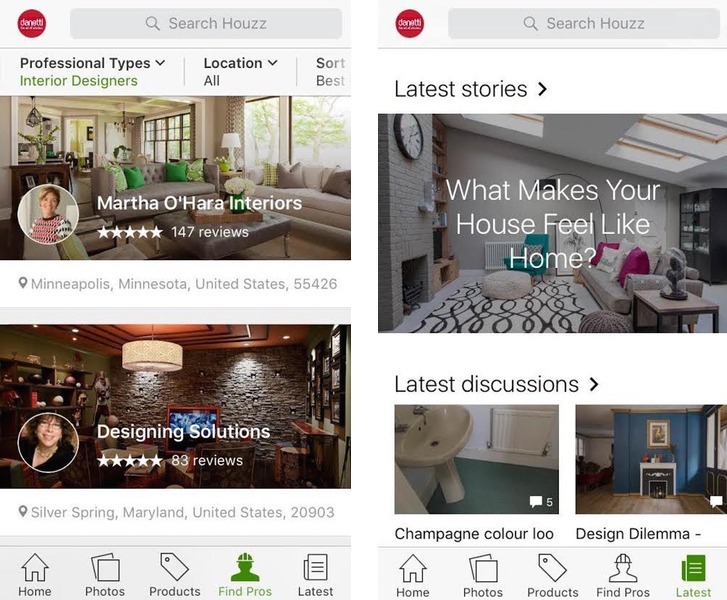 With features that make it a wonderful blend of other sites like Pinterest and Facebook, Houzz will become your go to design app when it comes to anything interiors. You can comment and share your ideas while also being able to save products to your own idea books. All of your idea books are saved on your profile for quick and easy access. Houzz is well known for its wealth of brand professionals using the site, meaning you can directly ask both brands and designers the questions you want answers to (you can view our Houzz profile here). With over 10 million photos and 35 million users, you really will have the world of interiors at your fingertips. 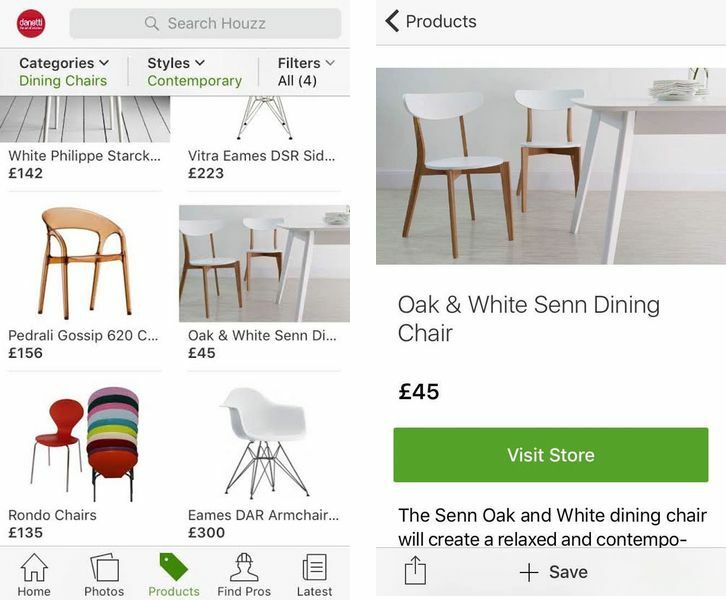 Easily find brands, designers and professionals through the Houzz app. Read all the gossip, blogs and latest trend news. You can also join in discussions and get advice on what to do with your space! 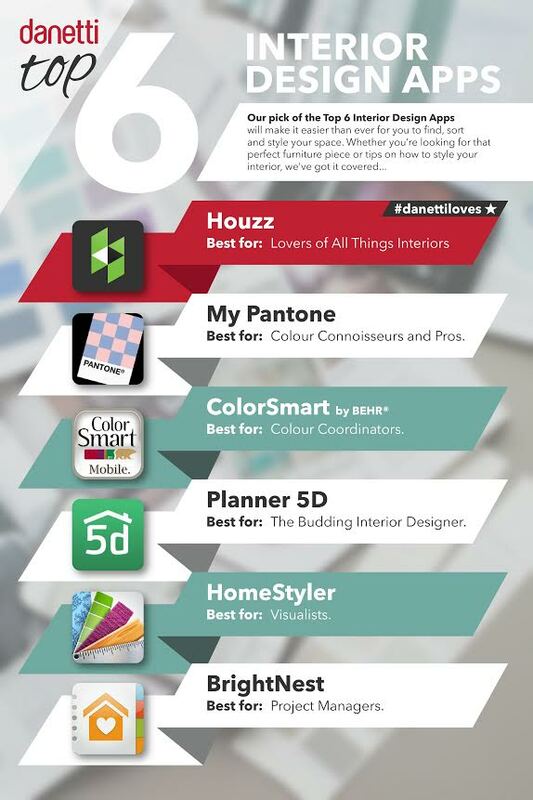 The Houzz app lets you search by space, style or product. Narrow down your categories and search terms to find relevant pieces. App Name: MyPantone Price: £7.99 Use it to: Find colours for your space Being the authority figure of the colour world, Pantone really does have the final say when it comes to disputes over whether it’s green or blue, pink or purple, turquoise or teal… The MyPantone app allows you to take pictures and match all of the colours in the image to the 1,000’s of Pantone shades. You can also find the RGB of colours. This is incredibly useful if you are doing anything on photoshop or online, as you can get an exact colour match. 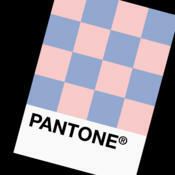 Being big fans of colour here at Danetti, we had a go at testing the app on the Pantone swatches we have in our office. Although the app did have some trouble finding an exact colour match to its own colour swatch, we can see its potential. Our design team said that they would probably use it for capturing colours on the go and making mental notes of colour references. 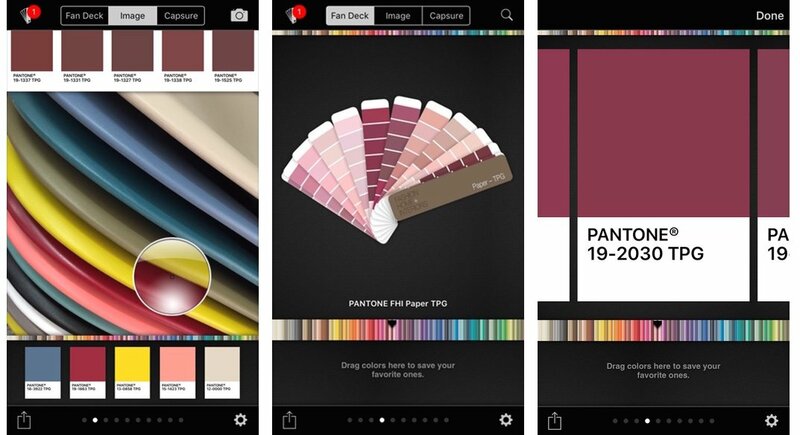 We use Pantone as a colour reference for a range of our products, so this app is great for matching up some Danetti pieces! There are so many colours in this app, so if you are a fan of colour it’s not one to be missed. Take your image and hover over your chosen colour to see Pantone's matches. Scroll through the variety of fanned decks to browse for a shade you like or to match up coordinating colours. 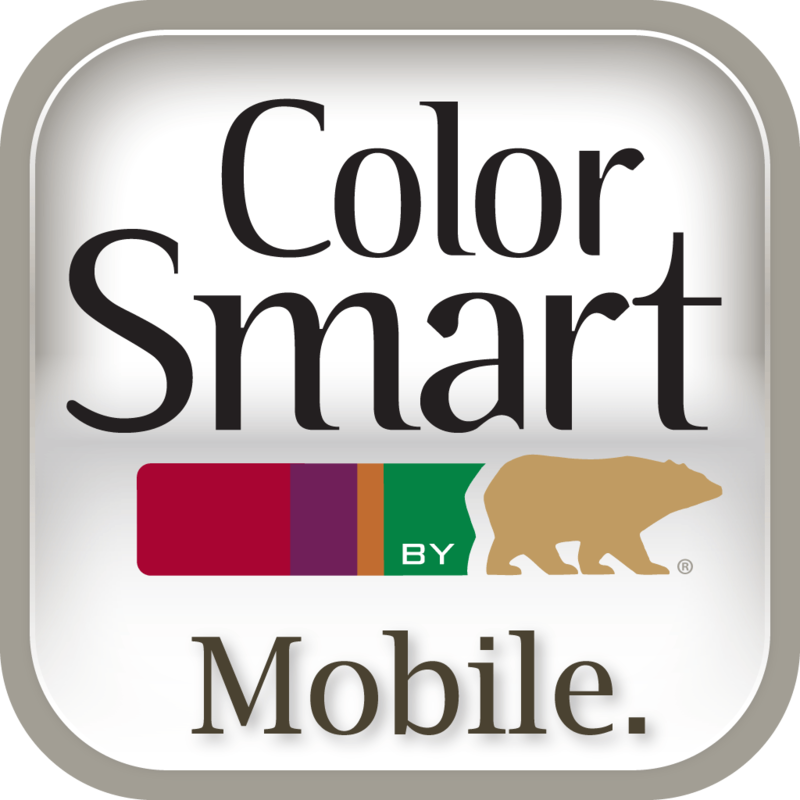 App Name: ColorSmart by BEHR® Price: Free Use it to: Find colours and see how they would look in a space If you don’t want to pay for the Pantone app, ColorSmart by BEHR® is a handy (and free) alternative. I wasn’t sure whether to include it on this list purely because you can’t buy their paint in the UK. However, the features in the app still make it incredibly worthwhile. Like the MyPantone app, you can take a photo and get a colour match to any of the shades in the image. The ‘explore colour’ tab gives you a whole variety of colours to choose from. It's also a great place to start when deciding what colour you want in your space. 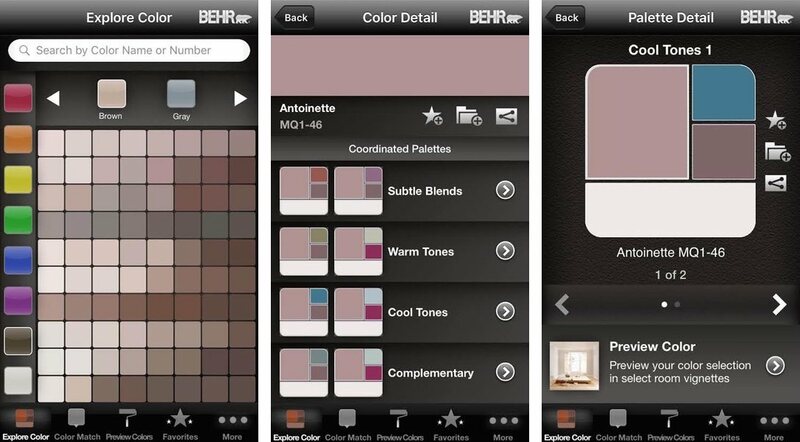 I really like how this decorating app suggests what colours will go with your selected shade. It also gives the palette a title which is so useful when you are trying to focus in on what look you want to go for. Seeing what colours coordinate best is also really handy when choosing furniture pieces such as occasional chairs or dining chairs, as you can get a rough idea of how the colours will work together in your space. From the selection of palettes, I opted for ‘cool tones’. Using the stock images provided, I was able to paint the colour onto the wall. Although this isn’t my room, I got a much better feel of what the colour would look like in a real space. This colour app is great for anyone who’s much more in the seeing is believing mindset, as it gives a much clearer idea of how colours can look in a real space and setting. Start your colour selection in the ‘explore colour’ tab. Once you’ve found your shade, browse the suggested coordinated palettes to see which selection would work best in your space. Now you’ve got your palette, choose a room and try out the different colours on the walls. You’ll be surprised how much this makes a difference to how you see the colour and how it looks in the space! App Name: HomeStyler Price: Free Use it to: See how your space will look I really enjoyed using the HomeStyer decorating app. It’s simple and easy to use while also being quite fun to just play around with. Firstly, you choose your space. This can be done either by taking a picture of your own room or selecting one of the stock images. You can then scroll through a whole variety of products, dragging and dropping the product where you think it looks best. You can select furniture by room or by brand. This is a great feature if you have a particular piece in mind and want a clear visual of how it could look in your space. The backgrounds that you use are flat images so there are no 3D room views in this app. I also had some trouble putting pieces at certain angles in front of particular backgrounds. However, this interior app is ideal if you want a quick and simple way of viewing products in your setting. Select, resize and angle your selected products in the space you’ve chosen. Once placed in your room setting, choose the location to see how the product will look. Each product links to a profile. This means you can go on to purchase the exact item when you find the perfect piece! App Name: Planner 5D Price: Free (with in-app purchases) Use it to: Create 3D models and floor plans of your home. 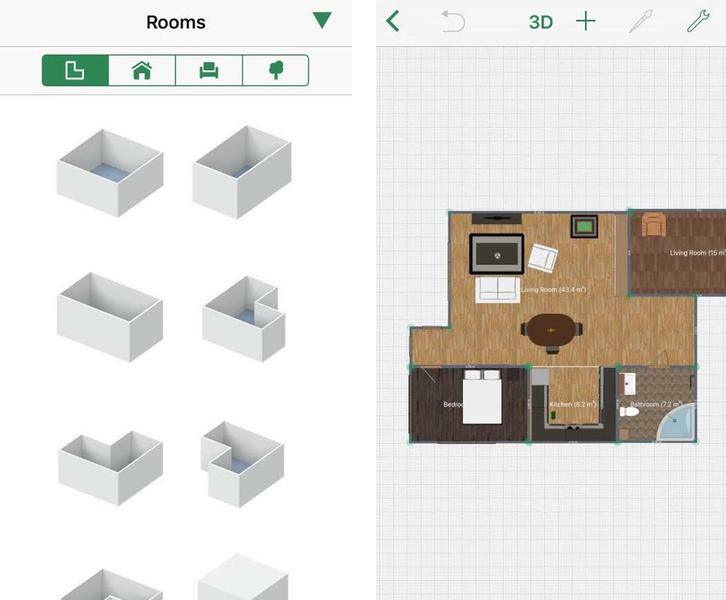 The best way to describe this app is that it’s like a handheld version of Google SketchUp for interior layouts. With both 2D and 3D modes, you can create your floor plan and place in different furniture pieces. By switching to the 3D view you get an even more in-depth look at your creation. Using the app is pretty straightforward. It’s just as case of using your fingers to click, drag and drop the various items. 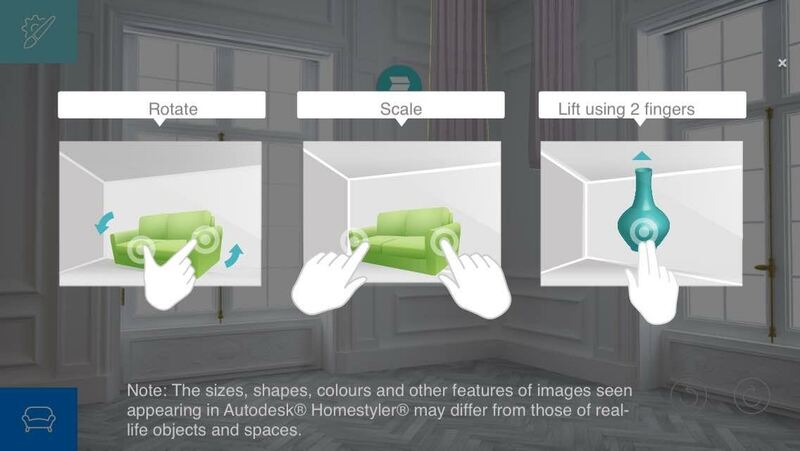 You can add measurements and keep your furniture to scale if you want a more realistic idea of how the pieces will not only look but also fit in your space. There are lots of product categories in this app, from windows and doors to tables and chairs, not forgetting your garden as there’s also trees, garages and even pools to choose from. The only ‘catch’ is that not all the items are free. If you want access to all the products in the app, you’ll need to upgrade to a paid version. However, if you’re committed to creating your ideal home in 3D model form, we definitely think it’s worth it. If not, there are plenty of free pieces to use and play around with to help you get a general idea of how the space will look. Choose what shape you want your space to be to get started. 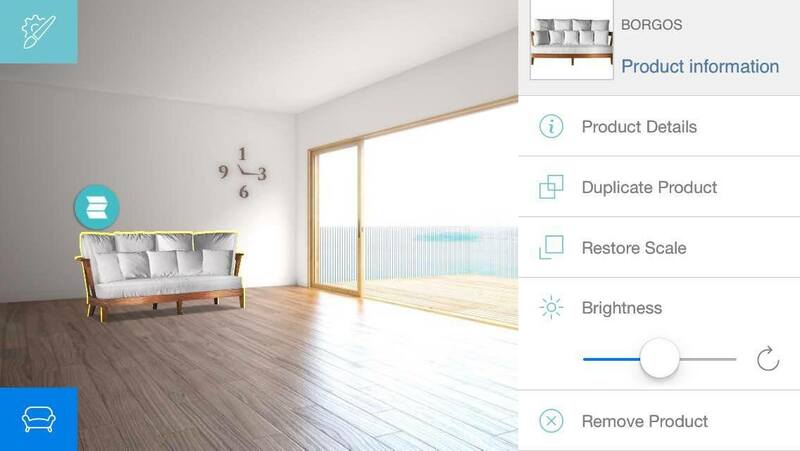 The app lets you create a space with rooms, doors and furniture, with both wall decor and flooring. I’d like to say I created this but sadly not, it’s one of the room demos that Planner 5D provides. It’s a good idea to have a look at the demos. That way you can really get a feel for the app's design potential! 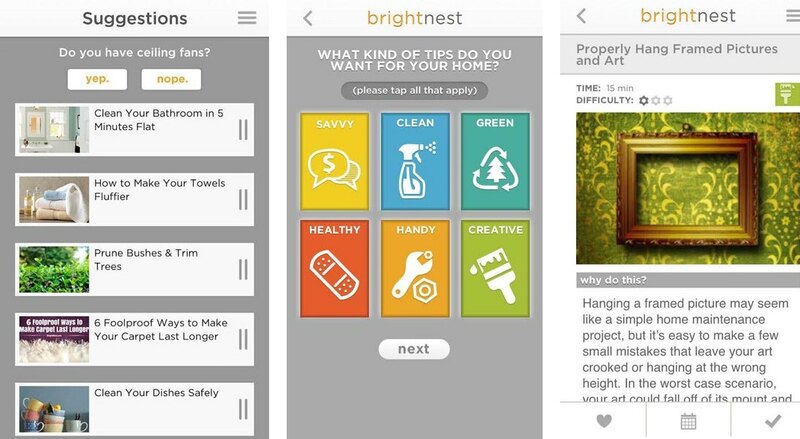 App Name: BrightNest Price: Free Use it to: Manage your project BrightNest is a great port of call for project management of both tasks and renovations. If you’re a little (...very) forgetful like me, this app allows you to create schedules and to-do lists to make sure you get things done. You can also use the app as a handheld notepad, jotting down the name of furniture pieces or wall decor you'd like to purchase. It’s great for keeping track of all the smaller things you are likely to miss when you renovate or move house such as cleaning the gutters and changing the batteries in your smoke detector. There's also loads of information for general home maintenance. You'll also be asked questions about your home. This allows the app to provide you with posts that are interesting and relevant to you. Choose the most relevant categories to get the most out of this app. BrightNest will ask questions to keep your content relevant and up to date. This is great because if you don’t have anything to do with ceiling fans, you don’t need to read about them! The various posts and mini style blogs offer pocket-sized information on a range of interior topics. The Ancona Extending Dining Table is a truly unique piece of dining room furniture, crafted and designed in Italy. 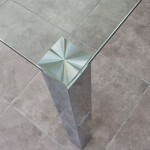 The table top is made from strong, vigorously tested tempered glass that has undergone a special process leaving a contemporary matt finish that prevents visibility of fingerprints on the surface. When you do need to clean the table then just use a damp cloth with warm water. Choose from a selection of colours and which type of metal finish you would prefer on the table’s frame and legs. Colours available include matt taupe with a powder coat finish and matt black veneer. As the name suggests, this dining table extends. Don’t worry about damaging your floor when extending the table as the legs have floor protectors to eliminate wear and tear. The best feature of the Ancona table is the tempered glass extension, and this is what makes this dining table so unique. It uses a sophisticated magnetic wheel on the frame to secure the extension to the dining table. This makes it extremely easy to open, whilst creating an elegant floating effect on the table top. This versatile table can be resized to suit your preference and the number of guests you are entertaining, with 3 different size options available. From the starting position with 6 places, the Ancona table can be extended both in length and width to accommodate 8 seats or extend even further to give 10 places for seats, for dinner parties with additional guests or entertaining indoors after a BBQ. When the extension is not in use it can be easily stored under table. Just slide the tempered glass extension under the table where it clicks in place using the magnetic wheel, without the need for any fiddly catches or locking mechanisms. For more information on our fantastic selection of stylish dining room furniture contact Danetti and speak to our friendly advisors who will be happy to answer any questions you may have and can help you plan and design your perfect living space. The modern and stylish Elise Dining Chair certainly stands out from the crowd, with its curvy design and elegant, tapered chrome legs. The beautiful backrest and seat is upholstered in luxurious but hard wearing faux leather. It is available in a choice of 8 fashionable colours: classic Black, warm Cream, rich Brown, Latte Beige, Poppy Red, Ruby Red, fashionable Putty Grey and modern White. The depth from the front of the seat to the backrest is 440mm which ensures the lightly padded seat is comfortable when you want to linger over dinner. The colourful Fern Dining Chairs are bright and cheerful, they will brighten up your home perfectly! The Fern Range of Dining Chairs are available in nine bright and fantastic colours: Berry Red, designer Black, Zingy Lemon, Purple Grape, classic White, Zesty Lime, Putty Grey, Sunset Orange and Sky Blue. 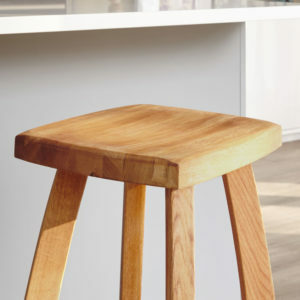 The slimline seat is made from laminated plywood which is hard wearing and sturdy. The seat and back rest are all one piece, which makes this modern dining chair look streamlined and seamless. The shapely Fern Dining Chair legs are finished in polished chrome which complements the bright coloured seat perfectly. 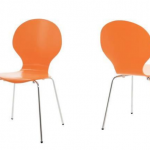 This chair is perfect for domestic use and will brighten up your dining area. 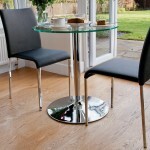 The Fern Dining Chairs would look great with a glass, wooden or white gloss dining table. The Fern chairs have great style and also offer great value for money. The Fern Dining Chair is now available in three new bold and fashionable colours: Putty Grey, Sky Blue and Sunset Orange. The Casa White Gloss Extending Dining Table is sleek and modern. This contemporary extending white high gloss dining table is perfect for hosting dinner parties, and is sure to impress your friends! This beautiful extending Dining Table is finished in fashionable White High Gloss which beautifully reflects the light in your dining area, creating a light and airy feel. 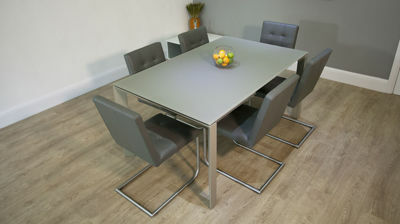 The stylish White Gloss Dining Table has four stylish square legs and frame which is finished in trendy brushed metal. The brushed metal frame and legs complement the sleek White Gloss Table Top perfectly. The trendy Dining Table extends at one end and when it is fully extended it seats up to 8 people. The two 300mm extension leaves are stored underneath the dining table top which means they can be easily and quickly slotted into place. When the Dining Table is unextended it measures at 1300mm, with one extension leaf it is 1600mm and with two extension leaves the Casa is 1900mm. 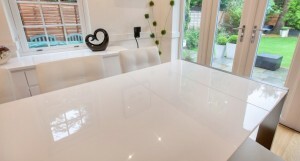 The Casa White Gloss Extending Dining Table would look fantastic with some of our stylish Dining Chairs. 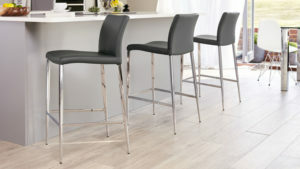 Take a look at The Moda, Lucia, Lilly or Louisa Dining Chairs as these would look beautiful with this white gloss table. 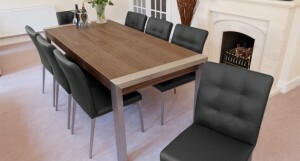 The Casa Dining Table is also available with a Wenge, Matt Black or Matt White finish. The Tiva Chrome and Clear Glass Dining Table combines style and elegance with simplicity, creating a modern and light feel in your Dining area. 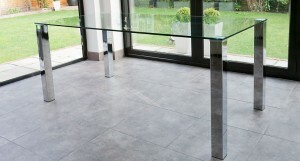 The stylish rectangular table has a tempered clear glass Table Top that is 12mm thick. The clear glass beautifully reflects the light creating a light and airy feel. The glass has been tested for strength and durability, certified to BS6206 which tests the quality of the glass and its strength against impact. 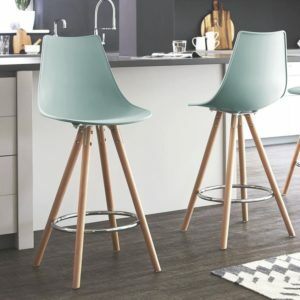 The stylish and elegant Moda Dining Chair is perfect for all modern kitchen-diners or dining rooms and it certainly stands out from the crowd. The Moda Dining Chair is upholstered in dense, high quality padding and then covered in a selection of faux leather colours. 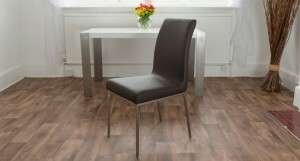 The elegant Moda Dining Chair is available in classic black, fashionable white, warm brown, rich cream or trendy grey. The faux leather has been quilted on the back to create a luxurious look and comfort. The slender brushed steel legs support the comfortable, quilted seat and they complement each other beautifully. The Moda Dining Chair would look great with one of your designer Dining Tables, especially if they also have brushed steel legs. The Danni Real Leather Dining Chairs offer both great value for money and fantastic quality, combined with contemporary style. 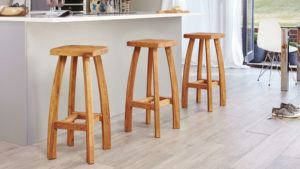 Ideal for modern kitchens and dining rooms. The Danni Real Leather Dining Chair stands out from the crowd, with its quilted, comfortable seat and backrest. 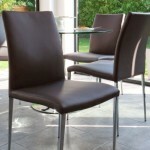 The seat and backrest are upholstered in comfortable, dense foam and then covered with high quality, soft real leather. 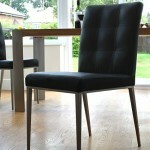 This modern dining chair is available in fashionable Charcoal Grey, with contrasting stitching, or trendy White Leather. The soft and comfortable leather is durable and hard wearing which ensures the Danni Dining Chair is practical for every day living. The beautiful quilted seat is supported by slender brushed metal cantilever legs and they complement each other perfectly. 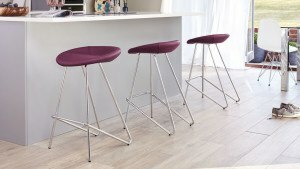 The Cantilever legs offer great support and comfort. The Danni Dining Chair would look stunning with one of our designer dining tables, perfect for your home. 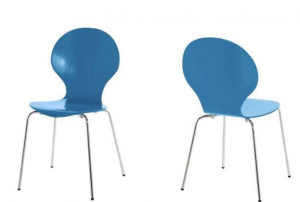 Take a look at our Top 10 Dining Chairs that are priced under £100. 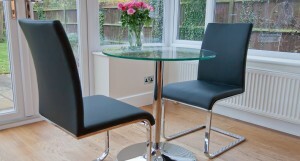 These fantastic dining chairs have style but also offer great value for money! 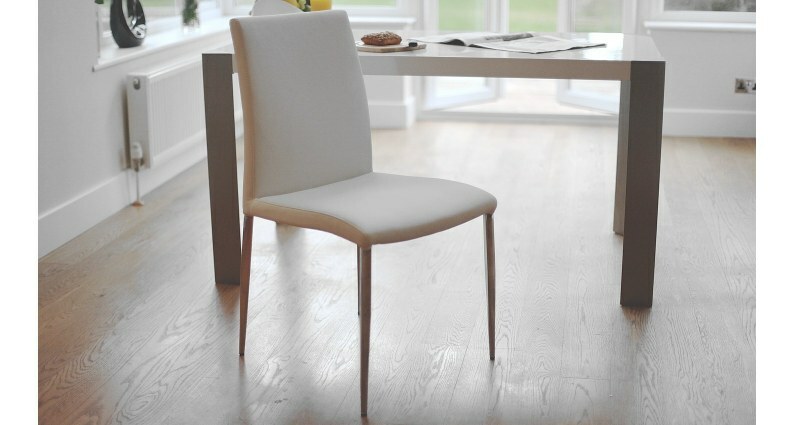 The elegant Tori Dining Chair is upholstered in high quality, soft faux leather. You can choose from a range of stylish colours: black, cream or white. The modern seat curves round the bottom to offer support and comfort. 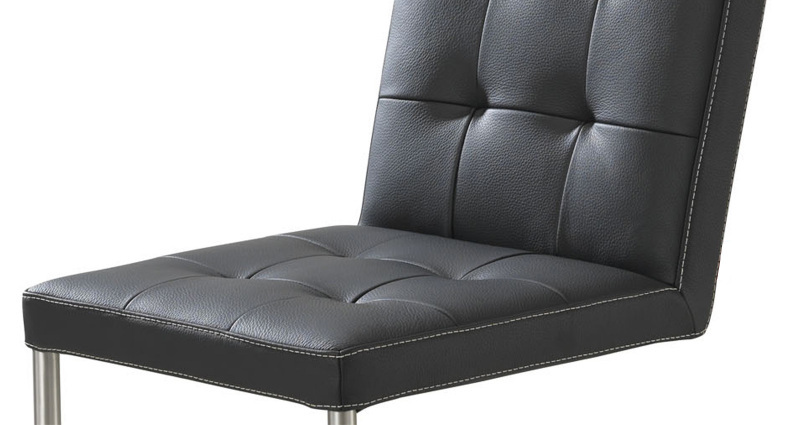 The faux leather seat and back are complemented by the slim squared chrome legs. 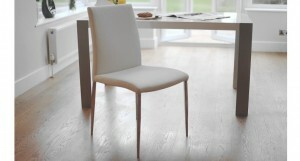 The Tori dining chair can also be stacked to save space, meaning this dining chair is very practical. This beautiful dining chair is priced at £59.00 each. The sophisticated Imola Dining Chair has a high back and padded seat making it an extremely comfortable dining chair. It is beautifully upholstered in dense foam and high quality, durable black or white faux leather. 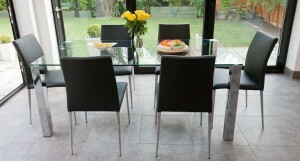 The funky cantilever legs are finished in stylish chrome which adds extra interest to the Imola dining chair. This stylish dining chair is £69.00. 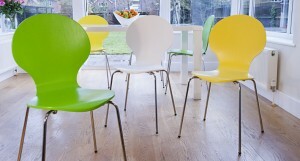 The colourful Argenta Dining Chair has chunky and modern curves. 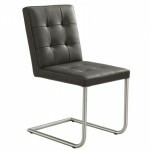 The metal frame and legs are upholstered in hard wearing faux leather. It is available in a range of fashionable colours: White, Poppy Red, Putty Grey, Pistachio Green, Mulberry Purple and Ochre Yellow. 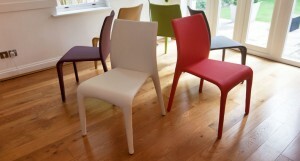 The Argenta Dining Chairs also have a stack-able feature so they can be stored safely when they are not in use. The Argenta is priced at £76.00. The trendy Moda Dining Chair is upholstered in high quality padding on both the seat and back to create extra comfort and then covered in a selection of faux leather colours including: black, white, brown, cream or grey. The leather is quilted on the back to create a luxurious look and offer extra comfort. The seat is complemented by the sleek brushed steel legs. 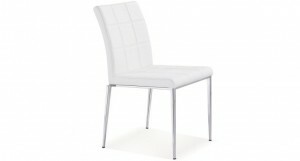 This modern dining chair is £79.00. The elegant Elise Dining Chair is upholstered in soft and luxurious faux leather in a choice of seven fashionable colours: Black, Cream, Brown, Latte Beige, Poppy Red, Ruby Red, White. 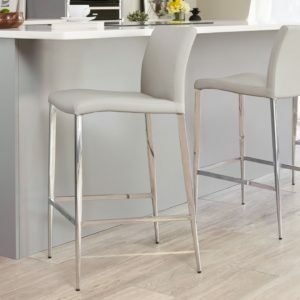 The slender and sleek legs are beautifully finished in polished chrome and they are tapered to create a sophisticated look. This beautiful dining chair is priced at £79.00. 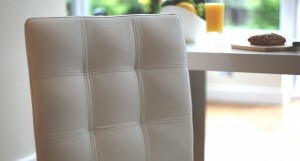 The modern Lucia Dining Chair is comfortable as it is upholstered in luxurious and hard wearing faux leather. It is available in a selection of trendy colours: Black, White, Putty Grey, Latte Beige, Espresso Brown, Mulberry Purple. 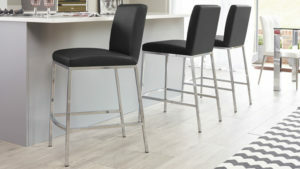 The curvy and shapely legs are finished in stylish brushed metal and are beautifully tapered. The Lucia is £79.00. The contemporary Verona Dining chair has a slim seat but it is extremely comfortable because it is padded in high quality foam and upholstered in soft faux leather. It is available in Black, Putty Grey or White Faux Leather. The swing Cantilever legs add style and are finished in trendy chrome. The Verona is priced at £89.00. The Lilly Dining Chair has a stylish retro design. 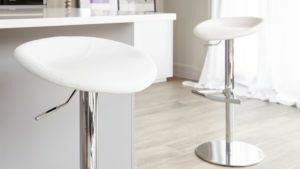 The gorgeous rounded back and comfortable seat are lightly padded in dense foam and upholstered in high quality faux leather in a choice of two colours: White or Putty Grey. The unique rounded back rest and seat are complemented by trendy and sleek brushed steel legs. 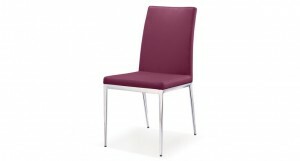 This stylish dining chair is £89.00. 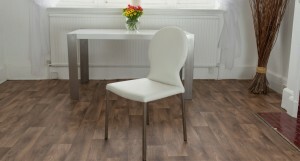 The Louisa Dining Chair has a slightly curved back to add style but also extra comfort. It also has a well padded back and seat to add extra comfort. The Louisa dining chair is beautifully upholstered in high quality faux leather in either: White, Brown or Almond beige. The stylish seat is supported by slim, modern brushed steel legs. The Louisa is priced at £89.00. The contemporary Lena Dining Chair is elegant and is quilted on both the back and seat creating a luxurious look. It is upholstered in high quality padding to add extra comfort and upholstered in either White or Putty Grey Faux Leather. The shiny chrome, tapered legs make the Lena very modern and trendy. The Lena is £89.00.